Kopf Electrode Manipulators are designed to manipulate stereotaxic drills, cannula insertion kits, micro injectors and other Kopf stereotaxic accessories. The Kopf design enables two manipulators to be placed side by side with bases touching. Each manipulator position can be articulated independently without disturbing the other. This is because of the narrow width of the slides and strategic placement of the screw-adjusting knobs. The end of the lateral slide has a precision “V” groove and locking thread to which electrode holders and accessory equipment may be attached quickly and easily. 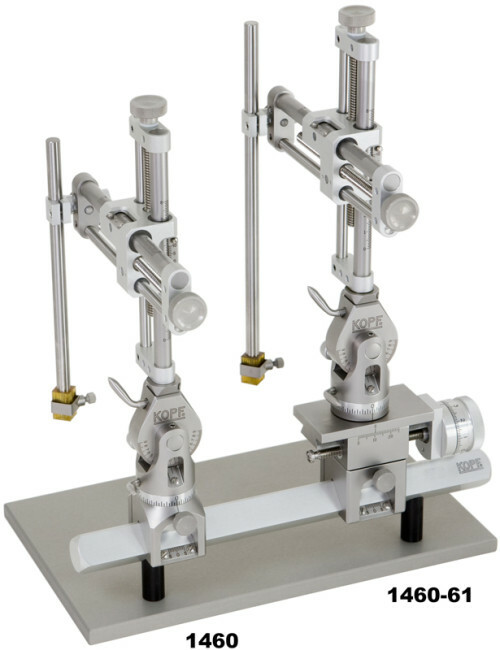 Manipulator X, Z adjustment – 80 mm travel calibrated 0.1 mm vernier scale (100 micron increments), 3.0 mm advance per revolution. Manipulator Y adjustment – Manual adjustment 100 mm each side of zero (A/P bar) 0.1 mm vernier scale. Rotation adjustment – Manipulator swivel base can be rotated up to 360°. Manipulator X/Z axis can be repositioned at 90° increments. includes all specifications listed above with the additional feature of a screw-driven A/P plane for fine resolution. Manipulator Y adjustment – Metric scale 25 mm travel. Calibrated dial – 10 micron increments, 1.0 mm of travel per revolution. Manual adjustment – 100 mm each side of zero (A/P bar) 0.1 mm vernier scale. Model 1460 Manipulator can be upgraded to include the fine adjustment A/P slide assembly. Call factory for details. The most accurate, versatile and maintenance free manipulators available. Simple to operate and does not require allen wrenches for use. Able to support accessory equipment. Positive screw locks and precision construction to assure efficiency and reliability.